Begin by sautéing the above ingredients in about 1/4 cup of Extra Virgin Oil in a Dutch Oven. Add a dash of salt, pepper, and a pinch of red pepper flakes. Sauté, stirring until onions and leeks are nicely softened and translucent. 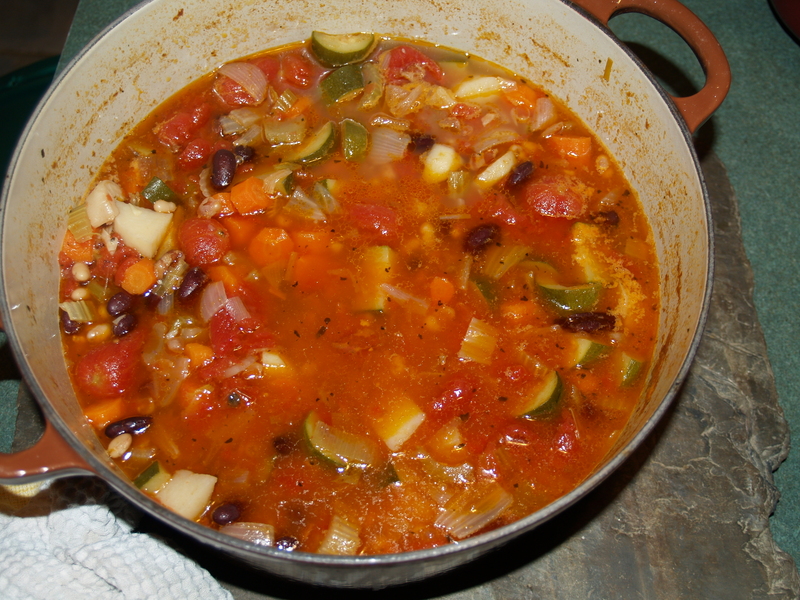 Cook, on low heat with lid ajar, for 1-1.5 hours until vegetables are tender. Then add beans – you can use any kind of bean, but I usually add one can of red kidney and one can of cannellini. Cook another 10 minutes or so. Taste for salt and pepper and add more if needed. Once done, I like to serve this with soup poured over barley. Barley is a great grain and very healthy – great for balancing blood sugar. I make a big batch and keep it in the fridge and each time I reheat the soup, I just put a couple spoonfuls of barley into my bowl and pour the soup over it. Another delicious and super-healthy addition to this soup is a Rosemary-Garlic Pesto. I chop fresh rosemary (about 1 tbsp) and fresh garlic (about 6 cloves), then I mix it with a dash of olive oil and drizzle this on top of my bowl of minestrone. So delicious. The Rosemary brings out a meaty flavor in the soup, and both the rosemary and garlic are great for keeping the immune system ready and able during the winter cold and flu season. Posted on January 19, 2016 January 19, 2016 by sorrelbarbara	Bookmark the permalink.